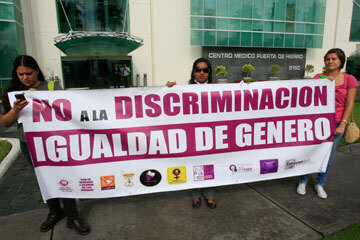 Female activists last week staged a protest outside Guadalajara’s Puerta de Hierro hospital to highlight the situation of former receptionist Yuridia Delgado Luevano, who says she was fired by the hospital after she told her bosses that she was a lesbian. Representatives of several civic organizations brought with them a document signed by 23,000 supporters of Delgado. Hospital officials refused to receive the document and ordered private security guards to block the entrance to the building. According to demonstrators, an automatic lawn watering system was activated in a bid to get them to move away. When this failed, hospital officials called the police and a public notary, who demanded they leave the premises or face forced eviction.